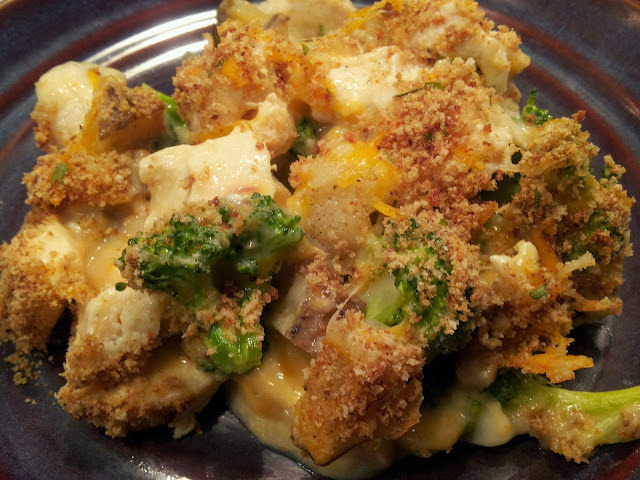 This casserole uses pre-cooked chicken, roasted potatoes and broccoli, so it is a good way to use up leftovers. Preheat oven to 375 degrees F. Dice potatoes and put in a greased roasting pan. Season with pepper and roast for 40 minutes, or until tender. In a second roasting pan, add chopped broccoli and season with pepper. Add to the oven for 10 minutes. If chicken breasts are raw, slice them into 2 inch wide strips and place on a baking sheet. Add to the oven for 15 to 18 minutes, until fully cooked. Slice the chicken into bite sized pieces. When all ingredients are removed from oven, grease a casserole dish and combine half of each of the chicken, potatoes and broccoli and mix. Add a layer of half the cheese. In a large measuring cup, combine milk, soup and onion powder. Pour half of this mixture over the casserole to coat. Add a second layer of chicken, potatoes, broccoli and cheese. Pour the remaining soup mix over and top with bread crumbs. Return to oven for 10 minutes with lid on, remove lid, and cook for 10 more. Allow to sit for 5 minutes before serving.